The Boston Fire Department reports a 55-gallon drum full of unspecified hazardous waste materials at the MWRA treatment plant became "over pressurized." We sent in an entry team under air in level B suits to release the pressure from the drum. There were no exposures or spills . There are no injuries to report. We evacuated the building as a precaution. Many of Boston's elected officials of color took to Twitter yesterday to support Suffolk County District Attorney Rachael Rollins in her verbal battle with the Baker administration over her plans to not seek to prosecute people charged with certain low-level crimes: Read more. The ACLU of Massachusetts now has a data person on staff, who's begun analyzing lots of data related to criminal justice, and one of his first looks is at "Declining to prosecute" cases for Suffolk County - the sort of thing that new DA Rachael Rollins said she would step up for certain types of low-level crimes: Read more. A group called MA 4 Trump was supposed to hold a get-together for supporters at JW's in Winthrop, but the restaurant canceled the meeting yesterday. In a Facebook post, the restaurant wrote: Read more. 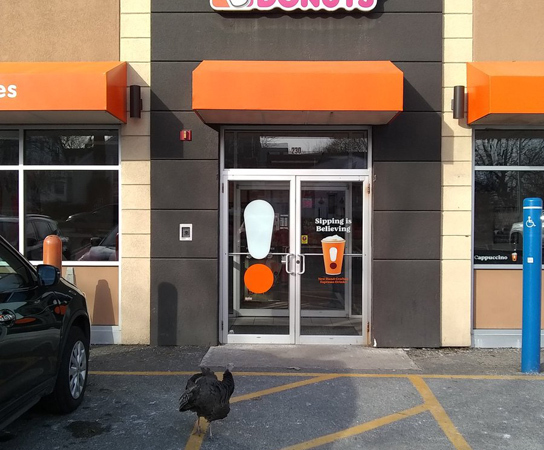 Nicholas Agri caught that most New England of scenes this morning: A turkey heading for the entrance of a Dunkin' Donuts, in Winthrop. The State House News Service summarizes a panel discussion with Rachael Rollins, newly elected Suffolk County DA and Liz Miranda and Nika Elugardo, both elected as state representatives. Miranda said that as a candidate this year, she felt she was "fighting" against a party that she says should have been helping her. The Globe follows up on the Herald's recent report on lesser crimes Democratic DA candidate Rachel Rollins says she would mostly have prosecutors not prosecute, and includes this nugget: Read more. The Dorchester Reporter reports he's not waiting until after the election; will step down in two weeks to become special counsel to a lobbying company. Conley had announced earlier this year he would not run for re-election. Democrat Rachel Rollins and independent Michael Maloney are running in November. The Jamaica Plain News lets challenger Katie Forde and incumbent Steve Murphy explain why voters should choose them for the job in this Tuesday's Democratic primary. The Globe reports Suffolk County DA candidate Greg Henning is pulling in tons of contributions from police officers. What's kind of interesting about those donations is that they all list the officers' address as 1 Schroeder Place, which is BPD headquarters - even if the officers work in the Revere, Winthrop or Brockton PDs - or are, in fact, Massachusetts state troopers. Jamaica Plain News interviews Katie Forde, who, for the second time in two years, is running for Suffolk County Register of Deeds against former City Councilor Steve Murphy - only this time she's his only opponent in the Democratic primary. Suffolk County DA Dan Conley today made it official: He's endorsing assistant DA Greg Henning to succeed him in the Sept. 4 Democratic primary: Read more. Herald photographer Mark Garfinkel was in Winthrop shortly before 10 p.m. when he captured quite the lightning strike over Yarmouth. CommonWealth takes a look at the race for the Democratic nomination for Suffolk County District Attorney - and efforts by some in the black community to get some of the candidates to drop out, which is leading to the same sort of backlash that happened with a similar effort in the crowded race for mayor in 2013. The primary is Sept. 4. The State House News Service reports on a forum the six candidates for Suffolk County DA held at the South Bay House of Correction yesterday. Rollins, Carvalho, Henning, Champion, McAuliffe. CommonWealth summarizes the ACLU-sponsored forum for the five Democratic candidates for DA at Hibernian Hall the other night. You basically have three candidates on the left (Rollins, Carvalho and McAuliffe), one who, if not a right winger, not exactly with any plans to become the next Larry Krasner (current assistant DA Henning) and one who shares some views with the first three and some with Henning. Carvalho, Champion, Henning, McAuliffe, Rollins. The five candidates for Suffolk District Attorney took similar positions on issues ranging from reducing the number of people who go through the criminal system to protecting law-abiding immigrants from ICE at a forum last night sponsored by JP Progressives and the NAACP. Read more. Too many progressives in the race for Suffolk DA? Four of the five people currently running for Suffolk County District Attorney this year support the criminal-reform legislation that just passed the state senate unanimously and which was opposed by just five Republicans in the house. That could be enough vote splitting to elect the one candidate who opposed the proposal, David Bernstein writes.